Welcome to Chapman McAlpine Law, a compassionate, solution-focused and committed family law firm in Barrie. We are resourceful and flexible and will do our best to keep your costs affordable. Ask us about alternative ways to work with you so that costs remain within your budget. We are staunch advocates who will provide you with sound, reasonable advice. We also know from experience that when dealing with other parties, an attitude of “determined reasonableness” can be very effective in reaching your goals. We will always tell you the truth. We are committed to honesty and transparency throughout the whole process. “Custody” refers to certain decision-making regarding children, while “access” refers to each parent’s physical time with the children. Child support refers to the amount payable by one parent to the other for the support of a child, while spousal support refers to the amount payable from one spouse to the other for the support of the recipient spouse. The matrimonial home is given special treatment in the area of family law. A matrimonial home is the property that two married spouses lived in which, at the time of separation, a spouse had an interest in and was ordinarily occupied by the spouses as their family residence. Our lawyers are experienced in negotiating and drafting legal Separation and Parenting Agreements for our clients dealing with all issues in a family law case. Our lawyers are experienced in representing clients at each stage of the court process in a family law case. There are multiple stages in a typical family law case. Limited Scope Retainers refer to a cost-effective alternative to full representation by a lawyer. This is an “a la carte” type of legal representation where you choose which aspects of your case you would like your lawyer to represent you on or provide you with advice for. Divorce refers to the legal dissolution of a marriage. 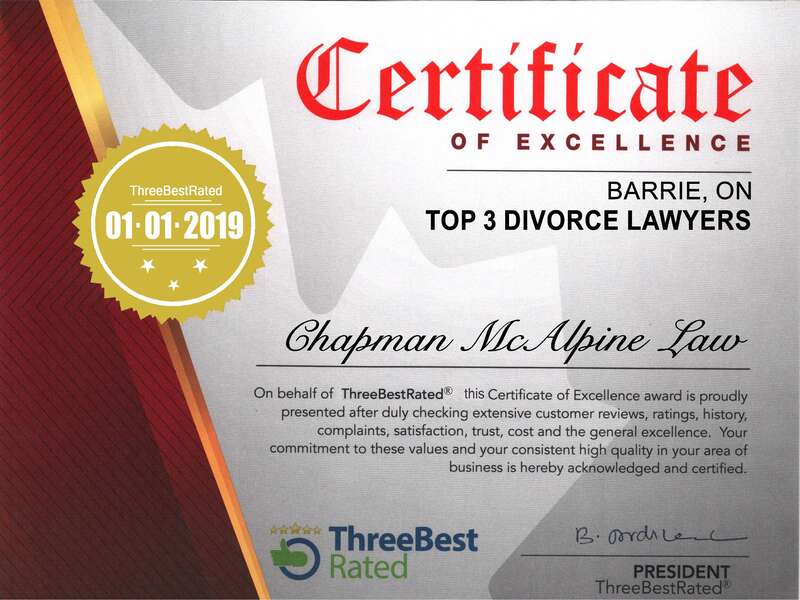 At Chapman McAlpine Law, we handle divorce-only cases on a competitive flat-fee basis. Obtaining a Divorce is relatively straight forward if all of the other issues have been dealt with in a separation agreement (e.g., custody/access, support and property issues). The laws differ for property division for married spouses (equalization) and common-law spouses. The law for equalization is governed by statute, whereas the law for common-law spouses is based on equitable claims made by case-law (judge-made law). There are various options in family law to resolve your case. The legal costs differ with each option as each option requires more or less involvement from your lawyer than the other options. Whichever option you choose your lawyer can assist you in finalizing your case with a court order or agreement. Kara-Lynne worked so quickly and efficiently to do the very best and get me to a place where I now know I have something to count on when I retire. In family law matters having someone standing beside you, guiding you and representing you and your best interest can make such a difference as you go through the process. She is a one in a million lawyer that I continue to recommend to anyone who is need. Absolutely AMAZING team!! Not only do they accommodate my crazy work schedule, but Kara, Barry, and Paul actually work with me on my case to ensure my kids are coming first. They’re always available when I need them and their dedication to their clients is bar none, and I don’t know where I would be without them! I cannot say enough good things about everyone who works here and recommend them to anyone who is in need of a family lawyer! I came to Chapman McAlpine Law after phone calls with many other law firms, but once I spoke to Paul, the level of comfort I had, I decided to canceled my other appointments. The attention to details, and level of attentiveness I’ve received from Kara-Lynne Chapman is unfounded. I now feel like I’m not going through this fight on my own. I know she’ll clarify anything I don’t understand, and walk me through everything. “Allison McAlpine did a great job at making me feel comfortable throughout the whole court process. I originally worked with her when she was first with a prior firm and now she is executing the same skill set at her own firm for a much more affordable price!!! As a father dealing with Family Court, I would 100% retain her again. I hired Kara Chapman for my divorce and various following motions. I can’t say enough about how incredibly professional, honest, thoughtful and considerate she was. She made the legal aspect of the experience much easier and I could always rely on her opinion and expertise. Kara-Lynne is determined, motivated and very compassionate. Her knowledge on family law is extensive. She works hard for her clients. She successfully helped me receive what was best for my children. I was awarded more than I originally thought I would; which was a huge relief. Kara is very professional and will go the extra mile for her client. She will always fight for her client and will not back down until a reasonable agreement is reached. You’re in good hands with Kara on your side. Allison and Paul have been quite expedient, informative and have shown genuine concern for my situation. I appreciate all of your efforts, upholding my confidence in your team to represent me in the best manner possible. Thank you. I am very thankful that I found Allison. She listened with compassion, provided sound advice and was very proactive in getting resolution to a difficult situation. Working with Allison was absolutely life changing. I highly recommend Allison and her staff. I would sincerely like to thank Allison McAlpine and Chapman McAlpine Law for representing me during a very difficult and lengthy separation. Allison’s support, patience and legal acumen most certainly guided me through the process to a satisfactory end result and I can now move forward with a new chapter in my life. Often in times of need, it is very important to work with professionals; who are attentive, who are smart and who are willing to listen with compassion, honesty and integrity. Allison and Paul were all of these and more. They typically went above and beyond, and provided excellent service, guidance and support. They were efficient, accurate and prompt making me feel comfortable throughout the process, as well as showed respect for my time too. COPYRIGHT © 2017 Chapman McAlpine Law . ALL RIGHTS RESERVED.